An artwork commissioned for Curtin University’s celebration of 50 Years of Innovation is on display at the John Curtin Gallery. 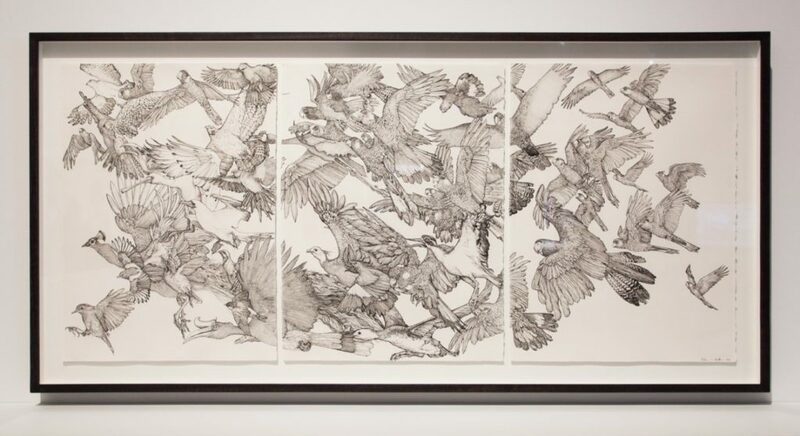 The artwork, Flock (50 Birds), was created by Curtin alumnus Andrew Nicholls and is part of Curtin’s 50fifty campaign launched earlier this year to further expand the University’s impressive art collection. Nicholls used the artwork to visually explore and honour Curtin University’s international growth over the past 50 years. “We selected Andrew for this project because of his experience in creating wonderful illustrative and narrative artworks and his connection with Curtin as an alumnus,” said the Gallery’s Collection Manager, Barbara Cotter. Nicholls graduated from Curtin in 1999 with a Bachelor of Arts (Art) with first class Honours. Since then, he has received two Creative Development Fellowships from the Western Australian Government and has undertaken commissions for several organisations in Australia and the United States, including a large ceiling mural for the City of Perth Library. In Flock (50 Birds) a Carnaby’s Cockatoo, an Australian native and a familiar sightfor those on the Bentley campus, flies alongside 20 species of native birds from countries across the world as a visual representation of the global university Curtin has become. Today there are over 100 nationalities represented in Curtin’s student body, including those on campuses in Malaysia, Singapore and Dubai. “With this project we wanted to celebrate both Curtin’s 50th anniversary and the many graduates who have gone on to forge successful artistic careers over the past five decades,” Barbara explained. 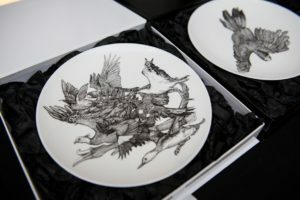 At the recent 50 Years of Innovation Gala Dinner, plates with sectional prints of Nicholls’ artwork were given to guests to commemorate the occasion. The underside of each plate has a brief description of the artwork’s significance.